"Open your HEART to me. Feel the rush of true love as our milk chocolate heart opens up to reveal the dreamy chocolates hidden inside"
The subtle and chic charcoal box decorated with graceful white feathers, revealing beneath a glimpse of pillar-box red base, hinting at the passionate contents...I raised the lid with great anticipation and - sharp intake of breath - my heart was shattered in a thousand pieces (gross exaggeration, but it was pretty smashed up) I was so disappointed, indeed heartbroken. You may have noticed that some of the the chocolate is missing, there certainly isn't enough there to make up the two halves of the heart. In my heartbroken state there was only one thing I could do...EAT IT! In my defence, you wouldn't have been able to see the cute little chocolate hearts in the photo if I hadn't: Dark Mousse, Lemon Berry Tart, Strawberry Swoon and Caramel Praline. My favourite would have to be Lemon Berry Tart, lovely tart lemon taste against the sweetness of the white chocolate, it was just divine. The milk chocolate of the heart shell was okay, but not the best milk chocolate I've tasted, and given that this little baby costs £25 for 255g of chocolate, I think it's time Hotel Chocolat upped their game on the quality of their milk chocolate. Generally I prefer dark chocolate and any Hotel Chocolat dark chocolate products I've reviewed in the past have been excellent. I was genuinely very surprised to find this chocolate was broken. As I said, I've reviewed a few different chocolate products for Hotel Chocolat and never had any problems with breakages. The box was well packaged and there were no obvious signs of the package having been damaged in any way. 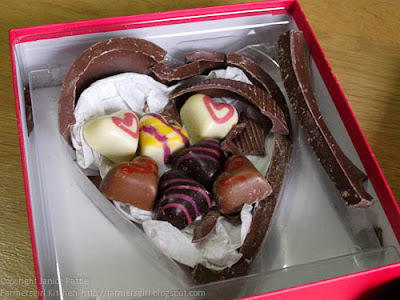 However, if I was disappointed when I opened the box and found the heart all broken, just think how unromantic it would be to receive a damaged gift for Valentine's Day. 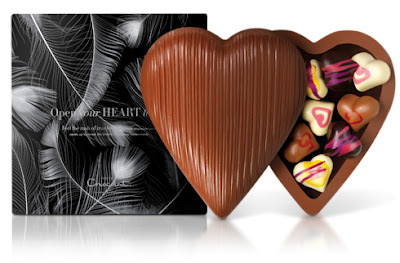 I think this chocolate gift is overpriced, the milk chocolate shell does not make me swoon and although the heart shaped chocolates are very nice, you could find similar quality for a lower price or more chocolates for the same price. If you do like Hotel Chocolat milk chocolate and are determined to 'give your heart' to your loved one, I would suggest you buy it from the shop rather than online, ask to check that it is intact before leaving the shop, to be sure that your lover 'feels the rush of true love' and you don't end up with a broken heart on Valentine's Day. I was sent these chocolates for review, I was not paid to give a good review, my opinions are my own. Disappointing, but I would love the chocolates. Love fruity chocolates. I just reviewed the same product and while I was really happy with the item as a whole, the chocolate shell was also badly broken when I unwrapped it. I thought maybe I was just unlucky but I guess not! I see yours fared a little better than mine Helen, at least the bottom half of your heart was in one piece, mine was completely shattered, such a shame. Oh that is such a shame! I think I'd enjoy the chocolates inside but wouldn't know what to do with the big heart, like you I'm not that keen on HC's milk chocolate.